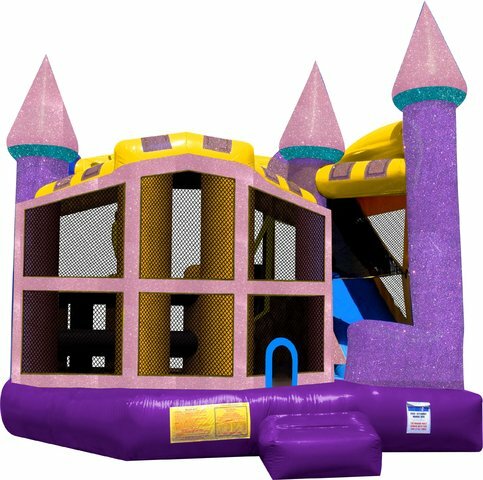 Dazzle Castle 5 in 1 Bounce house with attached slide wet or dry | AZ Jolly Jumpers Party Rentals | water slide and bounce house rentals in Goodyear, Arizona. Beatiful glitter wet or dry bounce house with attached slide. Bright, colorful, and sparkle filled perfect for your little princess, unicorn party, or any other event. This amazing inflatable is more then just a moon walk. Enter into an ex-large bounce house with a basketball hoop in the corner. Make your way through the several popup obstacles that will then lead you to the climbing wall stairs. Once at the top of the stairs you can make your way down the slide which leads you back into the bounce house.